USDA-NRCS PLANTS Database / Britton, N.L., and A. Brown. 1913. An illustrated flora of the northern United States, Canada and the British Possessions. 3 vols. Charles Scribner’s Sons, New York. (Accessed 9/2014). Carex folliculata is a perennial sedge, clumped, stems 30 cm to 1.2 m tall. Leaves of two types: basal leaves 0.6-1.7 cm wide, yellow-green; bracts below inflorescence leafy, 0.5-1 cm wide, longer than stems, sheath ending in lobe. 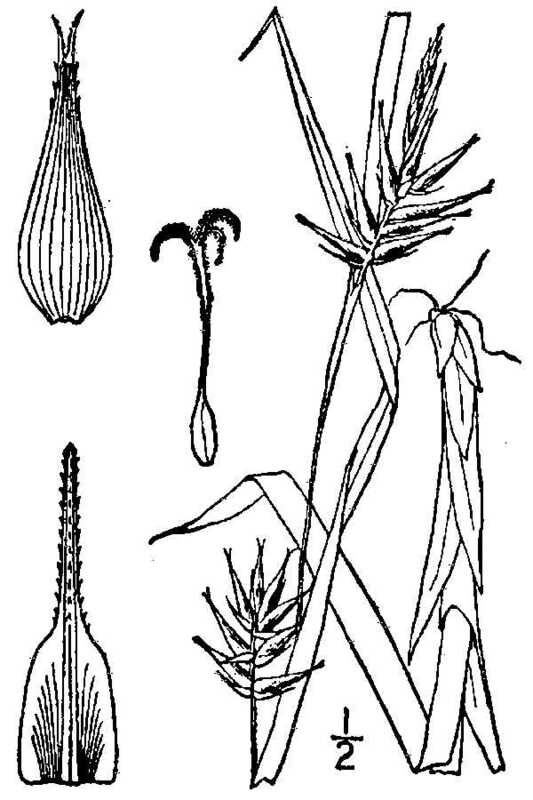 Flowers monoecious; male spike at top of stem, 1.2-2.5 cm long, stalk short to none, female spikes 2-5, large, 1.5-3 cm wide rounded, well separated; perigynia long, slender tapering to a beak, 1-1.5 cm long, 0.3 cm wide, relatively few, giving spikes spiny appearance, scales shorter than perigynia; blooms June-Aug.
Habitat: Wet woods. Found in a wet meadow and an upland site.